Corn & Oats open sandwiches and sprouts salad! My Sunny boy keeps me on my toes as far as his tiffin is concerned.The menu should be rolling and fresh and interesting. And i keep looking for making it a healthy collaboration.So what did we do this time? This time it was his favorite corn and my favorite Oats. When your son refuses to take oats in breakfast,you just hide it under a yummy delicious cover. And what better cover then his no.1 choice Corn.So i made oats and corn with the goodness of paneer open sandwich.With of course a snack ,as his school has two breaks and mommy dear needs to fill that tummy with the much needed nutrition. Keeping it simple this time CORN &OATS OPEN SANDWICH with a simple Sprouts ‘n’ Salad Chaat . The chaat is our good old sprouts with chopped cucumber ,onion and tomatoes with a lovely lemon and chaat masala dressing.How much did i score? Well my score was a completely clean tiffin. Yup “Mom the tiffin was awesome.What did you make.I loved it. Fix it for one day in a week”. Really?. Am glad son. 🙂 Ahh… i know if you are a mother ,then you can exactly understand my feelings.So go ahead and make these super easy open sandwiches and chaat for your wards tiffin next. Do leave us a comment and your story .We love to hear from you. Here is how to make these sandwiches. 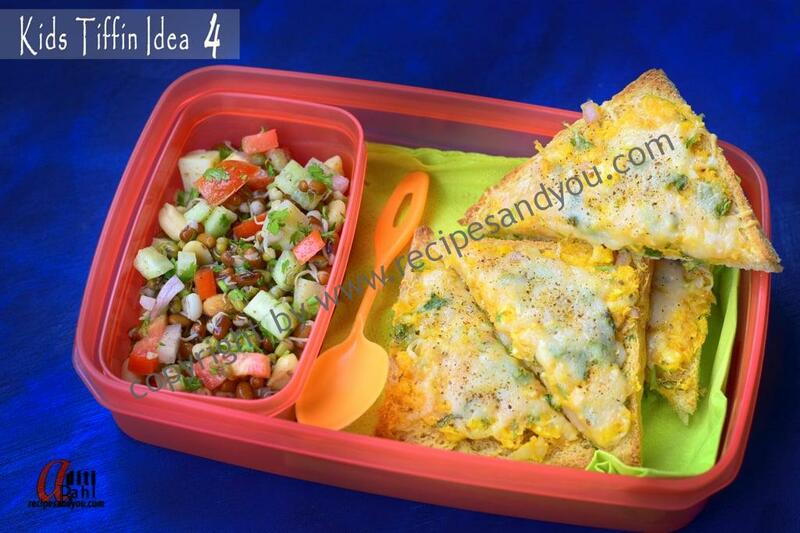 Kids Tiffin Ideas -Ready in 20 minutes. Kids Tiffin Ideas – Jack and the Bean stock. Kids Tiffin Ideas -Pan cake Pops. 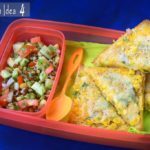 Kids Tiffin Box Ideas- Healthy Tiffin box idea. 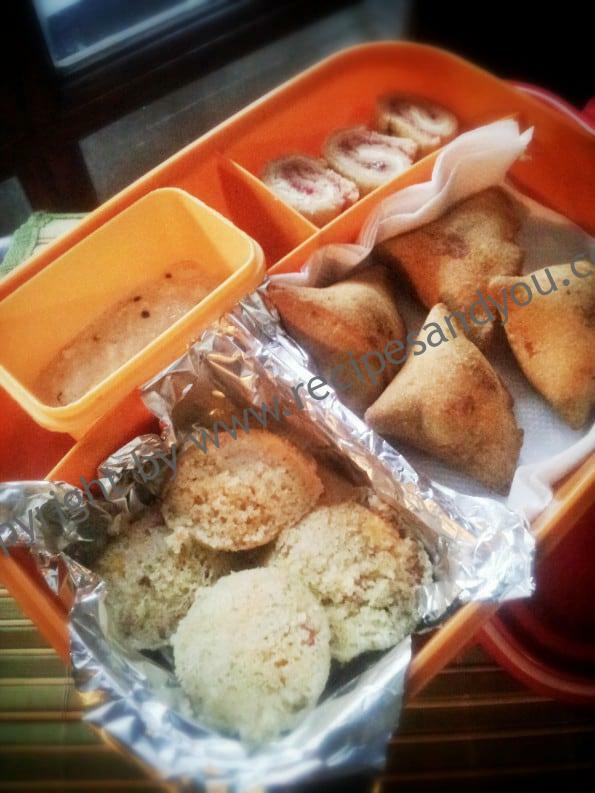 Kids Tiffin Box Idea : Healthy Indian Snack. Preheat the oven at grill option @250 degrees Celsius. Take 6 wheat bread slices and cut the edges. Now to prepare the topping: in a bowl mix together- ground corn kernels,paneer,oats,salt,spices and coriander leaves.Mix them well. (You can keep the ingredients ready a night before or make the topping a night before. Now,apply a generous portion on each bread slice. Grate some pizza cheese on top. Grill this in a baking tray for 5-7 minutes or till done according to your oven temperatures.Serve or pack in the tiffin with some tomato ketchup. FOR SPROUTS SALAD: I took the ready made sprouts available at the supermarket.Pressure cooked them on simmer till two whistles.Drained and cooled.You can do this a night before.In the morning just add the rest of the ingredients and this salad is good to go.It tastes best cool.